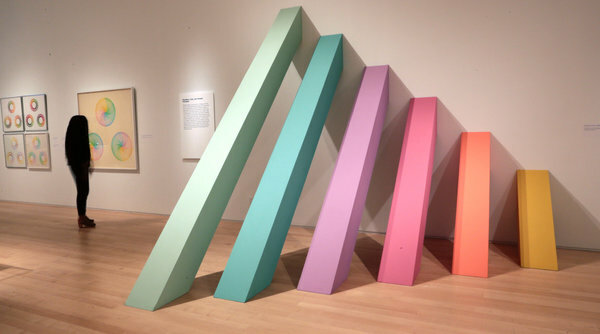 In assessing her own artistic legacy, Judy Chicago speaks of having suffered from what she considers a kind of “covert censorship”: “The only work of mine allowed to see the light of day in terms of real visibility is The Dinner Party,” she’s said. “My roots in Southern California and my participation in the art scene [there] have been erased. But I was very active… I was not really one of the boys, but I sure hung out with the boys.” Indeed, before she took the name of her hometown and began adopting overtly feminist content, the artist born Judy Cohen was on the West Coast, producing formally driven paintings, sculptures, and environmental performances which, while hinting at the political provocations to come (early titles include Heaven is for White Men Only and The Liberation of the Great Ladies), embraced the synthetic materials, restrained forms, and high-gloss finishes of the burgeoning Minimalist and Finish Fetish circles of late-60’s Los Angeles. Birth Hood, for instance, features a stylized rendering of the female reproductive system painted directly onto the dislocated hood of a ’65 Chevy Corvair, the results bluntly offsetting conventional feminine and masculine imagery; numerous other works, such as Through the Flower (1973), find the artist using an automotive spray gun to produce vibrant symmetrical compositions out of layered acrylic lacquer on canvas. These early efforts went largely unseen by broader audiences until 2011, when they were prominently featured in L.A.’s citywide Pacific Standard Time initiative. “Chicago in L.A.,” now showing at New York’s Brooklyn Museum through September, aims to extend this moment of reappraisal, charting the artist’s various activities through 1974, the year she began work on The Dinner Party. That installation, famous for featuring a series of plates explicitly inspired by female anatomy, has to date been written almost exclusively in terms of its activism and theatricality. Seen in light of these earlier works, however, the plates’ slick, glazed finishes and symmetrical forms take on fresh associations, recasting Chicago as an artist whose concerns lay as much in formal presentation as in radical content. In art, as in most things, context is content - our understanding of what we see and hear is shaped by the circumstances in which we encounter them; even the most deliberate gesture can be enhanced, altered, or obscured by its method of presentation. It’s an idea explored to intriguing ends in the work of Basel-based artist Hannah Weinberger: blending authorial intention, subjective perception, and peripheral incidence, Weinberger’s sound-based installations promote the interplay of coinciding elements, actively embracing the influence of external, ostensibly peripheral factors that lie beyond the artist’s prediction or control. Her compositions typically combine warm, ambient tones into lulling tapestries of sound; sectioned off into loops of varying lengths, each piece is played back through a series of multi-directional speakers that serve as the work’s only apparent visual presence. This unassuming display is purposefully designed to accentuate the more ephemeral, perhaps unacknowledged aspects of the audience’s experience: his/her chosen route and pacing, the acoustics of the gallery’s architecture, the coughs, scuffs, and muted conversations of fellow visitors. 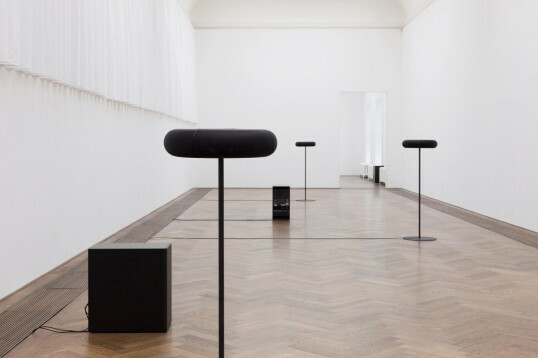 As a result, in moving through the space, each viewer-listener discovers a constantly shifting sonic landscape whose effect is at once composed and perceived individually – an improvised soundtrack unfolding in real time. Weinberger’s most recent offering, an eponymous installation currently on view at Fribourg’s Fri Art museum, explores these ideas to typically satisfying ends, with the work’s fluid negotiation of interior and exterior space confirming once again that the act of listening is inherently subjective and often multi-sensory, with even the most minimal settings capable of offering a rich and complex audiovisual experience - provided one pays close enough attention. 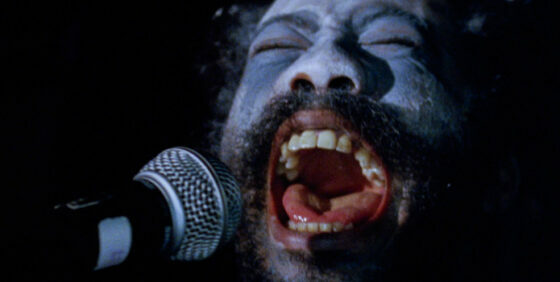 This second effort from Brooklyn-based filmmaker Tim Sutton (Pavilion) stars “outsider” musician/artist Willis Earl Beal as Ezra Jack, a Tennessee-based soul singer whose struggle with the pressures of writer’s block and audience expectations drives him to the edge of mental instability and social withdrawal. Wandering alone through his hometown, Jack’s search for meaning leads to a series of dreamlike encounters with local pastors, neighborhood hustlers, fellow drifters, and new lovers. Shot on location and featuring a cast comprised almost entirely of non-professionals hired on-site, Memphis retains a sense of authenticity bordering on the documentary, with many scenes seeming to unfold naturally, even haphazardly, in real time. This embracing of the nonlinear carries over to the film’s overall structure: as is quickly becoming a signature mode for Sutton’s work, the piece offers little in the way of exposition, transitions, or establishing shots, delivering instead a fragmentary but carefully paced sequence of impromptu interactions and lyrical segues – a style which the director calls “ethereal authentic.” Falling somewhere between folk tale and tone poem, the resulting work is a hypnotic stream of clouded impressions which, in their blurring of fiction and reality, make for an enigmatic, willfully unresolved but nonetheless affecting viewing experience. Employing media ranging from hand-drawn vinyl transfers to appropriated body jewelry, Sam Pulitzer’s work examines the process by which gestures of counter-cultural transgression gradually become codified and assimilated into standardized philosophies and lifestyles. 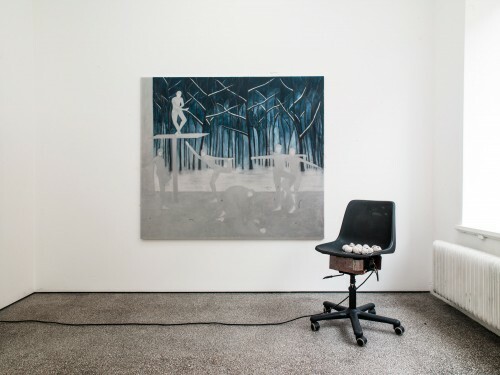 At times, the New York-based artist explores this theme through physical interventions of the exhibition space itself: for a 2011 show at Los Angeles’ Anat Ebgi, for instance, the artist repeatedly pierced the gallery walls with 1” gauged metal ear plugs; in recasting the white cube as a bodily form, he questioned the possibility of subversive activity in an environment which aestheticizes, and thus renders impotent, any attempts at nonconformity. 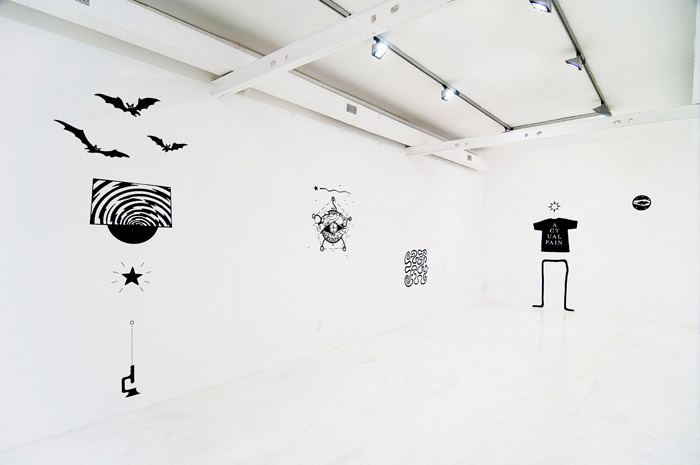 A 2012 solo exhibition at Fondazione Pastificio Cerere (Rome), meanwhile, saw Pulitzer adorning the space with vinyl transfers of stark, vaguely cartoonish illustrations whose allusions to anarchistic politics, goth fashion, punk and black metal music, and fantasy literature were translated into highly stylized graphic renderings. With his upcoming solo exhibition at New York’s Artists Space, set to open in March 2014, Pulitzer hopes to combine these strategies into a single comprehensive statement. The yet-untitled offering will find the artist installing an elaborate architectural labyrinth within the gallery space. Densely coating the structure’s walls with vinyl transfers of various commissioned illustrations and texts, Pulitzer will again ask the viewer to decipher a set of slogans and symbols whose cultural meanings are at once dependent upon and ultimately diluted by the context of their presentation. Chris Wiley is one of those rare individuals able to balance professional criticality (he’s an accomplished writer, curator, and editor, including time served as both a contributor and editor-at-large for Kaleidoscope) with the receptivity needed to sustain a progressive creative practice. In his visual output, which encompasses both photography and framed sculptural objects, Wiley draws from the unassuming, often overlooked corners of his surroundings, producing textured, geometric compositions out of isolated environmental details. “Dingbats,” his current offering at Nicelle Beauchene, finds Wiley’s eye fixed on a tawdry, faux-Modernist brand of architecture ubiquitous to Southern California. Offsetting the garish, ersatz quality of his subjects with thoughtful arrangements and vibrant presentation, the work embodies the balance of aesthetic aspiration and synthetic approximation that characterizes so much of American culture. Central to the series is the idea of framing: literally, in that Wiley has mounted his prints onto sculptural supports overlaid with materials appropriated from home décor (stucco, Formica, fake alligator skin, vinyl flooring, etc. ), but also in the sense that, in reducing his view to isolated details and discovered arrangements, Wiley treats his lens less as a window than an enclosure, offering a fresh view of common subjects while reaffirming photography’s status as an act of construction in every sense of the word. True to its title, New York’s annual New Directors/New Films festival is dedicated to finding what’s new and next in international cinema; now entering its 43rd year of screenings, the showcase holds a longstanding reputation as a kind of proving ground for emerging filmmakers, having introduced audiences to debut works by the likes of Spike Lee, Todd Solondz, and Steven Spielberg. Running March 19-30, this year’s program is characteristically diverse in both subject and style, with 27 features and 13 shorts culled from 29 countries. Among the most promising titles are Ana Lily Amirpour’s "A Girl Walks Home Alone at Night," a post-noir horror film whose depiction of a young vampire stalking her prey on strange urban streets serves as a none-too-subtle metaphor for the current political state in Iran; "Return to Homs," Talal Derki’s beyond-intimate account of the ongoing Syrian civil war; and the brooding, beautiful "A Spell to Ward Off the Darkness" (Ben Russell & Ben Rivers), which shadows a silent protagonist (played by Lichens frontman Robert AA Lowe) whose search for personal utopia finds him joining an Estonian commune and fronting a Norwegian black metal band before ultimately embracing the solitude of a remote Finnish forest. Favoring a literal approach to materiality, New York-based artist Charles Harlan produces austere sculptures and installations out of such common industrial products as steel roll gates, chain link fences, concrete columns, and aluminum ladders. In recasting these functional items as autonomous forms, Harlan’s gestures are consistently simple but nonetheless transformative, rendering familiar materials foreign through calculated shifts in visual orientation. 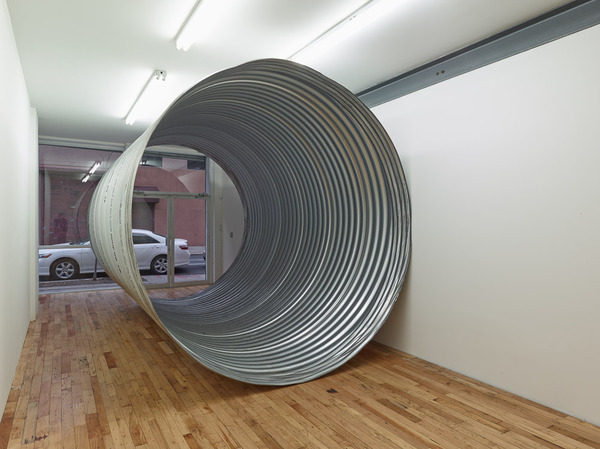 Much of the work finds Harlan in direct dialog with the more progressive facets of late-60’s American art, particularly Minimalism and Land Art: for his best-known piece, Pipe (2013), the artist installed a one-ton, 4.5x3m corrugated steel culvert in a small Lower East Side gallery, confounding the viewer’s sense of size and space through strategies adopted from artists like Nancy Holt and Richard Serra; in other works, he recasts Carl Andre’s floor-lain metal works with asphalt roofing tiles (Shingles, 2011) and approximates the pristine surfaces of Donald Judd’s metal cubes using vinyl tract siding (Siding, 2011). Though newly aestheticized, however, these items’ status as construction materials remains deliberately intact – which is crucial, for although clearly sensitive to the intrinsic textures and forms of his materials, Harlan’s concerns are ultimately architectural. Whether monumental or unassuming, installed in a white cube or mounted in an open field, the strength of each work lies in its physical presence and relative scale, reminding viewers of the extent to which works of art both shape and are shaped by the settings in which they’re shown.